This week we are back in the East End, at Cell Projects, an organisation which since 2000 has been offering affordable studio space alongside a programme of exhibitions designed “to encourage and promote urgent developments in the visual arts”. In a part of London that is being overtaken by generic glass and steel architecture at an almost incomprehensible speed, a visit to Cell is reassuringly idiosyncratic. The exhibition space is accessed via a yard and narrow alley overhung with tree ferns, then on, up a cast iron staircase. 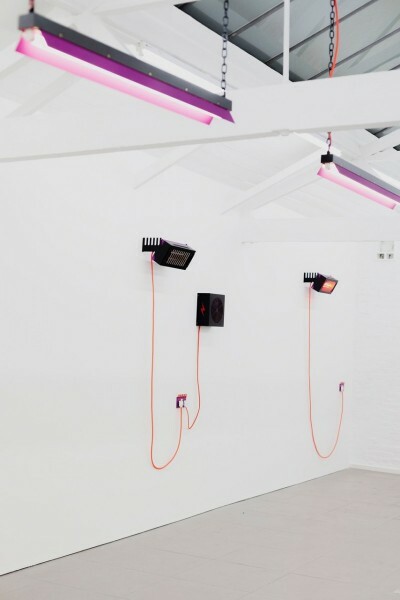 Natalie Dray has been part of group shows at V22 and Palazzo Peckham in London in the past few years, as well as having participated in some international exhibitions in Europe, but this is her first solo presentation in London since graduating from the Royal Academy Schools last year. This new body of work is a strikingly confident development of concerns that she has been exploring with increasing formal assurance. 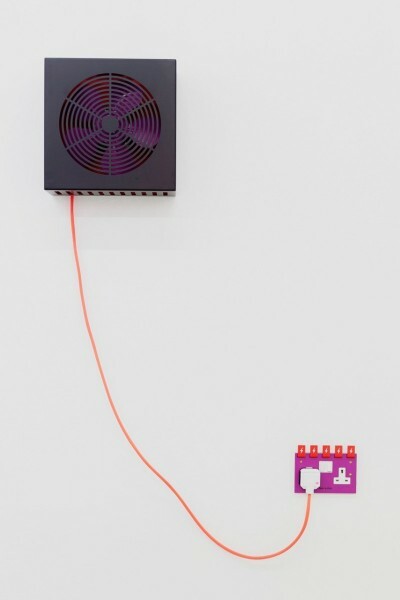 DRAY presents a number of wall-mounted works, variously functioning heating units and cooling fans, all set to invisible timer-devices which automatically switch them on and off. So there are visual, sound and temperature elements to assimilate when experiencing the work, as the incandescent bar heaters buzz and the fans whirr. Each unit has been designed and fabricated by the artist and evinces a kind of infrastructural quality that draws the eye for its more-than-normally sophisticated design values. Black powder-coated metal housings trail neon orange braided cloth flexes down to shiny fuschia plug sockets. Detail is everything here: note the bespoke PAT-test stickers and the perfectly dressed screws. The plug sockets are discreetly branded Dray & Sons, and if you look up in to the suspended fluorescent light fittings that take an elegant, skinny line down the centre of the gallery, you can see the same company logo die-cut into the metal shades. This is no whimsical, fictional invention: the artist’s father and grandfather run an electrical contractors in Brighton. Nor, it must be said, is the intention of the artist to provide a Marxist deconstruction or critique of male-dominated industrial production (that’s Dray & Sons we note) or mass consumption, although gender is not entirely absent here. For Dray it is the hidden protocols of security and safety standards enforced by UK manufacturing and building regulations that provide a matrix within which to make work. She co-opts the tension created by these conventions and the uniformity they enforce, and the desire to locate a space for the individual with them. It is exciting to see an artist of Dray’s generation expressing such a subtle accommodation of the contemporary world; when questioned she rapidly agreed that her sculptures are highly metaphorical objects, in spite of their ostensible borrowings from the language of American Minimalism. 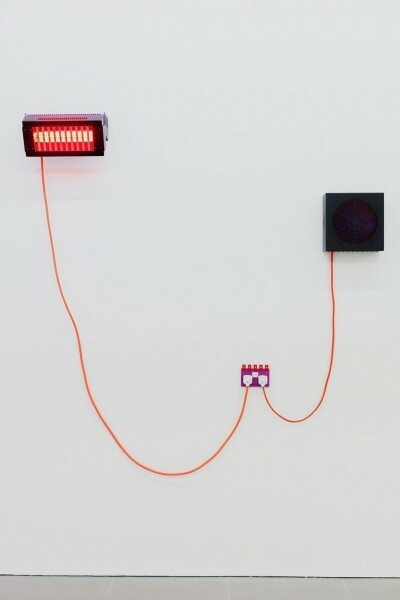 At the same time, Dray’s work is all about an intense engagement with and enjoyment of materials, and plays with visual cues such as the red lightning flash that appears on the side of heating units and on fuse tabs on the wall sockets. The flash symbol is instantly familiar from hazard warning signs, but such is the way that Dray subtly destabilises her lean iconography, one’s mind wanders also to Ziggy Stardust and 1970s glam rock. This is a not un-pleasing conjunction of mental images and only serves to render Dray’s work all the more utterly desirable.